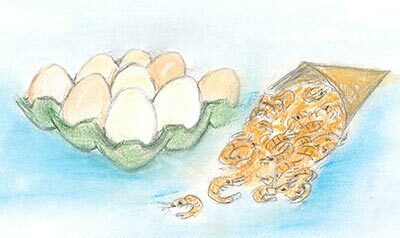 Today we have gone to the El Chiringuito del Señor Martín kitchen (Calle Mayor, 3) so they can show us how to make one of the most popular dishes on their menu: broken eggs with shrimps. The trick to this fantastic dish is making sure to separate yolk from egg and use fresh shrimp. To ensure we have fresh shrimp the restaurant chef, Beltrán Alonso, recommends that we pay attention to the texture of the shrimp, which should be hard, and the odour, which should smell of salt. Shall we begin? First, cut the potato into small straws. After cutting the potatoes, fry them in very hot extra virgin olive oil. Leave them frying until they’re crunchy. Once fried, remove the potatoes and leave them to sit on a paper towel to extract excess oil. In a pot, cook the shrimp by boiling them for 30 seconds. After, take them out and allow them to cool in ice water. Meanwhile, crack an egg, making sure to separate the egg from the yolk. In a hot pan, add a little oil and the egg white, moving it constantly until it coagulates over medium heat. Turn off the heat, add the potatoes on top, and mix the ingredients until they’re well blended. After mixing these two ingredients, add the shrimp and the egg yolk. For an even more delicious result, add some chives. Add salt to taste.